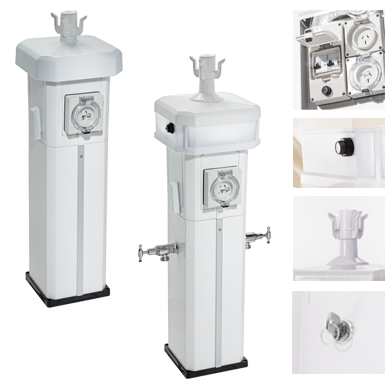 The M1 series modular slimline design can provide all essential marina services including metered water and power and data outlets. The M1 500 known as the ‘Mini Berth Mate” is best suited for up to two 15amp outlets, two taps and LED light with PE Cell. It is a perfect solution for private jetties and pontoons. Add 15amp Power Outlets up to 2. Add up to 2 taps. Add up to 2 TV outlets. Add up to 2 Phone outlets. Add up to 2 Data outlets. Can be made with switched outlets. Add up to 2 approved Din- Rail kWh Meters for user pay power. Add up to 2 water meters for taps.